The original Monkey Business was a Japanese literary journal was published between 2008 and 2011. 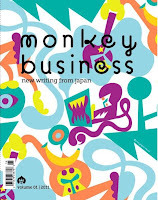 2011 also saw the launch of Monkey Business: New Writing from Japan, the English-language, international edition of the journal. Edited by Motoyuki Shibata, who was also heavily involved with the original Monkey Business, and Ted Goossen, the English-language Monkey Business is released annually and collects a variety of fiction, poetry, nonfiction, essays, and manga. The selections found in the fourth volume of the journal, published in 2014, come from a range of sources, including but not limited to the original Monkey Business and its followup journal Monkey (launched in 2013). In addition to works that had previously been published, some of the contributions selected were specifically commissioned for the fourth issue. I’ve been reading and enjoying the international edition of Monkey Business since its beginning and always look forward to the newest volume. Other returnees to Monkey Business include Stuart Dybek with the short story “Naked,” Hideo Furukawa with “The Bears of Mount Nametoko,” Yoko Hayasuke with “Eri’s Physics,” Mina Ishikawa with “The Lighthouse on the Desk” (which is a collection of tanka poems), Mieko Kawakami with the story “The Little Girl Blows Up Her Pee Anxiety, My Heart Races,” Taki Monma with “White Socks,” and Richard Powers with “The Global Distributed Self-Mirroring Subterranean Soul-Sharing Picture Show,” a fascinating essay about Haruki Murakami’s fiction and brain science. The two manga contributions included in the fourth volume of Monkey Business are also from artists who have been a part of the journal in the past. Brother and Sister Nishioka adapt Bruno Schulz’ story “Tailors’ Dummies” (it’s nice to see them branch out from works by Franz Kafka) and Fumiko Takano illustrates a highly abstract adaptation of “The Little Match-Girl” by Hans Christian Anderson. A translation of Anderson’s original story is also included, which is particularly helpful for those readers who are not familiar with it when trying to make narrative sense of Takano’s rendition. While it’s wonderful to see so many returning creators to Monkey Business, I also greatly appreciate that the journal always includes someone or something new. “Everybody’s Got Something to Hide Except Me and My Monkey”, the fourth volume’s opening work by Craft Ebbing & Co., is probably the most unusual—a series of photographs of an art piece with accompanying narration. Of all the newcomers to this issue of Monkey Business, I particularly enjoyed Brian Evenson’s short story “The Punish” and the tangentially related “A Message to My Japanese Readers,” a collection of short essays by Evenson and three other authors (Laird Hunt, Denis Johnson, and Salvador Plascencia). Other short stories from authors new to the journal include Doppo Kunikida’s “Unforgettable People,” Kenji Miyazawa’s “The Restaurant of Many Orders” (previously I had only read examples of his poetry), David Peace’s “After Ryūnosuke, Before Ryūnosuke” and Hyakken Uchida’s “The Sarasate Disk.” Overall, I don’t feel that the fourth volume was quite as diverse as previous issues of Monkey Business. However, it’s still a solid collection. Many of the stories tend toward the slightly strange, bizarre, and absurd, but that’s a sort of fiction that I happen to enjoy. 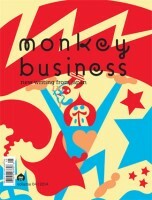 The English-language, international edition of the Japanese literary journal Monkey Business made its debut in 2011. Issued annually, the third volume was released in 2013. Having read and enjoyed the first two volumes, I was looking forward to reading the most recent issue. Motoyuki Shibata, the founder of the original Monkey Business, serves as the journal’s head editor along with Ted Goossen. In part, Monkey Business is intended to feature new and accomplished Japanese authors not well known outside of Japan. At the same time, it also includes innovative work from creators in other countries as well—in this particular issue the United States and Korea. The third volume of Monkey Business selects works from as early as 1924 while others are being published for the first time (in any language.) As usual, short stories, manga, poetry, essays, and excerpts from longer works can all be found within its pages. Accompanying Yokomitsu’s “Time,” and returning to Monkey Business, is Toh EnJoe with his essay “Time in ‘Time. '” Naoyuki Ii also provides an essay for this volume, “Living in Your Own Private Cubicle” which explores Franz Kafka’s The Metamorphosis and Herman Melville’s “Bartleby, the Scrivener” as company-man fiction. This essay pairs nicely with the Brother and Sister Nishioka’s manga adaptation of “The Metamorphosis.” These paired contributions are some of my favorite works in Monkey Business. Other favorites include Keita Jin’s short story “Exorcising Dreams” and Tomoka Shibasaki’s short essay “The Glasses Thief,” which open the volume. I am also rather fond of Barry Yourgrau’s short story “The Mask.” Actually, I find it difficult to name favorites since there are so many strong contributions in Monkey Business, Volume 3. Once again, Goossen and Shibata and everyone else working on Monkey Business have put together a terrific collection. The piece I struggle with the most is “Monkey Child—Human Child” by Masatsuga Ono. While I can appreciate it, personally I find the short story stylistically difficult to enjoy. But I did like all of the other pieces included in Monkey Business, Volume 3 from returning creators: Mina Ishikawa’s collection of tanka poems “Urashima,” “Neither Purity Nor Defilement Now” by Hideo Furukawa (who has had a short story in every issue of Monkey Business so far), Hiromi Kawakami’s “The Dragon Palace,” and Mieko Kawakami’s “Dreams of Love, Etc.” The volume closes with the third part of Sachiko Kishimoto’s “The Forbidden Diary,” which for me has always been one of the highlights of Monkey Business. Most of the works in Monkey Business, Volume 3 are not directly related although The Metamorphosis is a frequent touchstone and dreams and dreaming are recurring themes throughout the collection. I very much enjoyed this installment of Monkey Business and am already looking forward to the next year’s offerings. I have anxiously been awaiting the second volume of the English-language edition of Monkey Business ever since I read the debut issue last year. Japanese readers are lucky—they generally only had to wait a month between issues of the original Monkey Business literary journal. At the moment, the English edition is published annually. 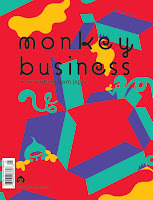 Motoyuki Shibata, editor of the Japanese Monkey Business, and Ted Goossen once again serve as the head editors for the 2012 issue of the English Monkey Business. They have put together a volume that is even bigger and maybe even better than the first, drawing from at least as early as the November 2008 issue of the Japanese literary journal and including selections from some of the more recent issues as well. Shibata and Goossen don’t limit themselves to works found in the original Monkey Business journal, either. A few of the contributions in Monkey Business, Volume 2 are being published for the first time in any language. The English edition of the journal is published with support from the Nippon Foundation. Monkey Business, Volume 2 collects twenty-two works of short fiction, manga essays, and poetry—eight more selections than were included in the first issue. The second volume begins with “What Do You Wish We Had in Japan Today?,” a question that was asked of seventeen creators a month after the March 11th earthquake and tsunami in Japan in 2011. Their responses are a wonderful mix of the serious and fanciful. This is followed by Masatsugu Ono’s short story “I Chase the Monkey and the Monkey Flees from Me, the Monkey Chases Me and I Flee from the Monkey.” Although it has moments of frequent brilliance, I found it to be a difficult story to read overall. It almost seems like a prose poem, similar to Mieko Kawakami’s “A Once-Perfect Day for Bananafish,” which is also found in Monkey Business, Volume 2, although the two works vary substantially in feel. Other poetry collected in the second volume includes “Tales in Tanka” by Mina Ishikawa (my personal favorite), “Nowhere” by Stuart Dybek, and Minoru Ozawa’s haiku collection “Ghosts and Ghost Paintings” which includes the original Japanese along with the English translation. Everyone who worked to put together Monkey Business, Volume 2 has done a wonderful job. What I loved most about the first volume was the wide variety of contributions. This is still true of the second volume. And because it is longer than the first it includes even more variety. Some of the contributions are immediately accessible while others require the reader to put in some effort in order to really appreciate them. Admittedly, it’s not always easy reading. The works selected for Monkey Business, Volume 2 are drawn from nearly a century of creative output. While most were originally written in Japanese, a few started out in English. I’m beginning to more easily recognize the contributors’ work outside of Monkey Business; the journal has introduced me to creators who I want to follow and that I seek out. With its mix of eccentric fiction, nonfiction, poetry, illustration, and manga, I can’t wait for the next volume of Monkey Business to be published. Monkey Business is a Japanese literary journal edited by Motoyuki Shibata that was founded in 2008. The journal focuses on contemporary literature from Japan and includes the occasional older work as well. In Japan, Monkey Business is published more or less quarterly. 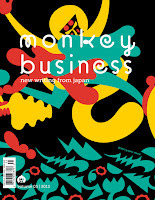 The English edition of the journal, Monkey Business: New Writing from Japan (sometimes seen refereed to as New Voices from Japan), debuted in 2011 and is planned to be an annual publication. Once again, Shibata is acting as the editor along with the aid of Ted Goossen. It is published by A Public Space and is supported by the Nippon Foundation. The first volume selects, collects, and translates fourteen contributions from the first ten issues of the Japanese edition, published between spring 2008 and summer 2010. Roland Kelts, author of Japanamerica is one of the contributing editors of the English edition and has been publicizing the Monkey Business, which is how I found out about the journal. After a very brief introduction by the editors, the first volume of the English edition of Monkey Business opens with a short story translated by Michael Emmerich by Hideo Furukawa called “Monsters.” It’s a disconcerting, manic, and vaguely apocalyptic narrative punctuated by sections akin to poetry. Other poems in the volume include “The Sleep Division” by Mina Ishikawa, “Interviews with the Heroes, or Is Baseball Just for Fun?” by Inuo Taguchi, “When Monkeys Sing” by Masayo Koike, “Monkey Tanka” by Shion Mizuhara, and “Monkey Haiku” by Minoru Ozawa, all translated by Ted Goossen. Poetry is notoriously difficult to translate and I feel Goossen has done an excellent job. Although they all have their merits, the most accessible poem and the one I was most fond of was Taguchi’s and I’m not even particularly enamored with baseball. I would argue that the centerpiece of the first volume of Monkey Business, due to length, location, and name recognition for English language audiences, is “Pursuing ‘Growth’,” an interview with Haruki Murakami conducted by Hideo Furukawa in December 2008 and translated by Goossen. I actually haven’t read any of Murakami’s works yet (scandalous, I know! ), but I still found the interview fascinating. There are two collections of mini-stories and vignettes included in the first volume: “People from My Neighborhood” by Hiromi Kawakami (translated by Goossen) is delightfully quirky and nostalgic while Barry Yourgrau’s “Song, the Old Way, and Bougainvillea” is gritty, dark, and bloody. I was happy to discover manga within the pages of Monkey Business as well—”A Country Doctor” by the Brother and Sister Nishioka, or Nishioka Kyōdai, which is based on a story by Franz Kafka translated by J. A. Underwood. Short stories in this volume of Monkey Business include “Closet LLB” by Kōji Uno (translated by Jay Rubin), “The Tale of the House of Physics” by Yōko Ogawa (translated by Goossen), and what is probably my favorite contribution in the entire volume, “Sandy’s Lament” written by Atsushi Nakajima and translated by M. Cody Poulton. The story is based on the Chinese classic Journey to the West and made me smile the entire time I was reading it. Apparently it is part of cycle by Nakajima, so I really hope to see more of them in included in future volumes of Monkey Business. This issue ends with “The Forbidden Diary,” excerpts from a fictional, but autobiographically influenced, diary by Sachiko Kishimoto, also translated by Goossen. What I like best about the inaugural issue of Monkey Business is the wide variety of contributions selected. I love that manga, short fiction, poetry, and interviews can all take their place next to one another. I also greatly appreciated the list of contributors at the end which provides a brief introduction to the original creators, editors, and translators. Each entry generally includes mention of other works of theirs that are available in English. I found this section particularly valuable since I didn’t initially recognize many of the contributors by name and am definitely interested in pursuing more of their work. Overall, I was very pleased with the first volume of Monkey Business and I hope it does well enough that we’ll see another volume issued in 2012 and more volumes after that. I wouldn’t hesitate at all to recommend Monkey Business to someone interested in contemporary and experimental Japanese literature. It introduced me to creators I might not have come across otherwise and I am very glad for it.